In the early twenties, mother, dad and I were living in Carnarvon Grove, Huthwaite. Dad was a miner working at Winterbank Pit, Normanton. At that time wages were very low. Mother thought there must be something she could do to bring in more money. Having heard that an elderly woman in Huthwaite worked on chevenning, she made enquiries and found that it was embroidery on men’s socks. So Mother learned to chevon, and worked some new patterns up with a view to showing them to sock manufactories. A factory down Mansfield produced knitwear and socks, “Seal and Turners”. Mother saw Mr Seal and he agreed to try the work. The samples were satisfactory, so it was agreed he would pay three shillings and sixpence per dozen. Once a week, Mother went down to the factory on the tram with a large bag to collect the work, and return the finished work. Other local women became interested. With children at school and the men at work, it was a perfect way to earn extra money. It obviously grew more productive, so Dad left the Pit, and turned the front room into a work area. They built some racks and a counter to give work out, accept it finished, and pay for finished work. Mother received three shillings and sixpence, and payed the women three shillings. Dad delivered the finished work to Mr Seal, and returned with more for the following week. The work was going well and it was obvious more room was needed, so when Mother and Dad heard that at the top of Lime Avenue, Huthwaite a Soldiers and Sailors Army Hut was for sale for £100, they decided to buy it. We all cleaned it. Dad put benches in and bought stools so that women could work in the factory if they wished. Later, six linking machines were obtained and they worked on joining the toes on men’s socks. In order to obtain more work, Mother went to Leicester to the large factories such as Blackbird Mills, Corah Bros and James Heath and Sons. On seeing the sample work, all managements agreed to supply work each week. By this time we had a small car, Mother could not drive so Cliff Fisher took her to Leicester once a fortnight to acquire more work. James Heath and Sons produced pale silk stockings for the Royal Households Footmen and Staff. These goods were so valuable that the work was put on the train for Dad to collect at Sutton Junction Station. Several women were responsible for joining the back seam and then working the embroidery. The factory needed more room, and next door on the left stood a railway carriage occupied at that time by a Mr and Mrs Bostock, who were wanting to move their home to a site on Huthwaite Road. The land was purchased, and Mr Vardy the builder proceeded to erect a factory and garages. 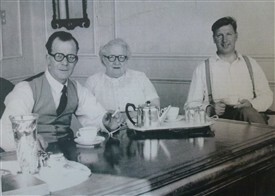 In 1931 Wilfred Parsons joined Mother and Dad as a junior partner, also Mr Jim Wass and his brother as sleeping partners. A short while after, the factory became a Ltd Company. By now it was decided to start making blouses. The chevoning was still working well with girls being employed in the factory. 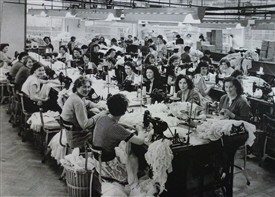 A designer was employed to design blouses and Wilf travelled the Midlands for orders from warehouses. Eventually, he acquired Roders from C + A, BHS and Littlewoods Catalogue. The blouse for the catalogue was a very young style in taffeta navy, bottle green and also brown. It sold for five shillings. That work ran for two years, and kept the factory on full time. Will had been going down to London for almost two years to try to get Marks and Spencer’s to look at the blouses. The designer was producing some very nice styles. By then we had a new designer from Nottingham, a Miss Ansell. Eventually, contracts were given but what Dad did not like was the fact, if you work for Marks and Spencer, you did not work for anyone else. Having given a contract on a style, they chose the fabrics and terms and when these items were delivered to you, then all payments were your responsibility. Very often, that contract would not be started for two to three months. By this time, a great many machines had been installed and a very large cutting room employing six or seven cutters working under June Ramsell, head cutter. On leaving school, I had been put on the cutting table under Mary Rowleston, where I stayed until I was twenty one. As Wilf or Dad could not keep the machines in good working order, a mechanic Fred Wheldon was employed. This gave Wilf time to see to all the office work and contracts, and Mother was responsible for all the quality of work. In 1988 I married and went to live in Barlborough, I still came to work every day until the war broke out, and Harry was called into the army. I came back to Sutton to live with Mother and Dad for the duration of the war. When the war was over, Harry and I returned to our own home. By then, we had one son Geoffrey, and another son Philip. Wilfred also returned from the air force. During the war, the main amount of work was two contracts, one from Boots the Chemists, this was towelling to be used in gas masks. The other was bra work for Everlastic of Beeston. 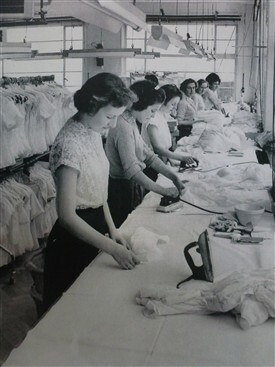 Work was still the main contract for Marks and Spencer, and the factory was on full time. Later on, Mother and Dad came to see Harry with the view he would join them in the factory to work with Fred on the machines. The machinery was getting too much for Fred on his own. This led to Harry taking over on Fred’s retirement. Eventually we returned to Sutton to live. I started in the factory to learn Mothers work, making it possible for her to spend less time at work if she wished. Geoff was at university, and Philip joined Harry, Michael was still at school. I worked under Wilf for two years on work delivery. During the next two years pleated tricel became very popular. 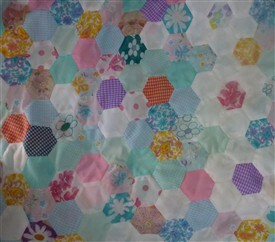 All the fabric was taken to the Manchester area to be pleated in paper. These blouses were so popular that the contracts came for more than two years. This work needed Harry to change some of the machines to do X-stitch and faggotting, also he developed a machine to cut the binding. Marks and Spencer decided to start selling night dresses, very young styles. Miss Ansell produced some good designs which were accepted by Marks. This meant we had to have another large room which was just for the production of nightdresses. The overlooker for all this work was Joan Stevenson. All work was ironed before being packed, also the blouses by five or six ironers and two packers. Later in the year, another extension was added, delivery bay, new workshop and a new heating system. During the summer Mother decided to go on holiday to Europe, but returned home unwell. This led to her spending less time in the factory. It was a very serious illness, leading to her being in a London hospital for a month. Sadly she died on 29th December 1961 at the age of 67 years. We were very busy for the next two years on nightdresses. The tricel blouse was finished, so we then started to produce a more tailored silk blouse with Swiss lace trim. All the work was going so well and Dad decided he wanted to retire. This was a great surprise to every one. The question was why? So Wilf decided to retire to his farm in Blidworth. In June 1963, the factory was sold to a Nottingham Firm, Everlastic. Harry and Philip moved to the Nottingham Factory into Development. I stayed with them until January 1964. This made it possible for Harry and I to rent a small factory on Kirkby Road belonging to Mr Jim Betts, and start a business of our own called “Siesta Lingerie”, also for Harry to start his own firm “T.D.S. Development”. The years of working on our own gave so much pleasure. We shared it with so many great people. Later on, the factory became “P & M Hardstaff” I still miss it. This page was added by Marg Thorne on 18/04/2018.